A special gathering was held at High Meadows Golf and Country Club in Roaring Gap, where the Pro-Am Charity Tournament Committee presented a check for $10,000 to the Alleghany County Community Foundation (ACCF) for the Alleghany Opportunity Fund. The gift from High Meadows will benefit the Alleghany Opportunity Fund, a permanently endowed source of financial support for nonprofits in Alleghany County. Through the Opportunity Fund, ACCF annually awards grants to local nonprofits through an open application process. 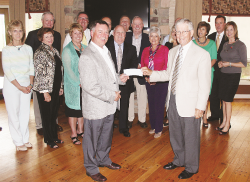 According to Ralph Garner, chairman of the High Meadows Pro-Am Tournament Committee, it was important that the donation be used to benefit and support organizations in Alleghany County. Like all of ACCF’s eight endowment funds, the Alleghany Opportunity Fund exclusively supports charitable causes and organizations in Alleghany County. During the presentation, Garner touched on the Committee’s goal of improving networking opportunities among the High Meadows Club and the surrounding communities of Sparta and Alleghany County. Edwards was joined at the event by several members of the ACCF’s board of advisors as well as Jennifer Tolle Whiteside, president of the North Carolina Community Foundation, of which ACCF is one of 60 affiliates across the state. The NCCF provides a variety of professional services, including investment and financial management, to its local affiliates. Decisions regarding grant funding, however, are made at the local level. “One of the main goals of the North Carolina Community Foundation is to support and promote local philanthropy and to do so in partnership with other community organizations,” said Tolle Whiteside. “We are so thankful for the support of the High Meadows Country Club and I commend them for their efforts to give back to Alleghany County. We are proud to partner with High Meadows and hope to build on this partnership in the future.